Many pilots seem confused and/or intimidated by “flight following,” the common name for the radar-based services that ATC offers to VFR pilots. Unfortunately, the information about how to take best advantage of these services is scattered among various FAA publications, including the FARs, AIM, ACs, and handbooks. To help address this issue, I’ve created BruceAir’s Guide to ATC Services for VFR Pilots (PDF), which you can download from the preceding link. I worked with several colleagues who are TRACON, tower, and ARTCC controllers to ensure that the basic information is as complete, accurate, and practical as possible. Of course, you may find that things work a little differently in various parts of the country. Individual controllers have their preferences. Workload and local procedures and constraints can affect how things, well, work. But in general, I believe the information in the document is an excellent starting place for pilots who want to use flight following. This document is intended to help pilots use the VFR services offered by ATC. Flight instructors may find it helpful when teaching students and customers about these services. Although I’ve tried to provide accurate, complete, and practical information, this guide is the work of one flight instructor and pilot (with help and advice from several air traffic controllers at facilities around the U.S.). It is not guidance from FAA or a substitute for information from official sources. Obviously, current regulations, FAA policies, and recommendations in the AIM and related resources are, so to speak, “controlling.” If you have specific questions about ATC services for VFR aircraft, consult the references included in this document, your flight instructor, and the FAA—including the ATC facilities in the areas where you fly. The document includes an annotated list of and links to references to specific FARs, sections of the AIM, and free resources offered by AOPA Air Safety Institute. I’ve also added a couple of links to books and interactive training products that I recommend to students and customers. If you’re interested in this topic, download the PDF and review it. Please leave comments here. Here’s a YouTube video of an introductory aerobatic lesson (not a ride) from last week. This is a typical first lesson. We’ve briefed the maneuvers, safety procedures etc., but for the first lesson, at least, the experience is usually still disorienting. And there’s no way to anticipate how well the student/customer will tolerate G, etc., so we typically don’t get through everything we brief. For all those reasons, you can see why one flight isn’t sufficient to learn even one or two maneuvers. This was the first flight with my GoPro Hero2. As you’ll see, I put it on my head, using the GoPro strap. It worked well (of course, there’s some rapid panning as I look around), but I’ll have to adjust it. It’s above eye level, of course, but I also had it tilted a bit skyward, so the view isn’t exactly what I see (the camera actually has a slightly better view of what’s straight ahead). I combined the video from the on-board cameras, the GoPro, and the Countour HD (the "hero" cam in the front seat) to produce this video, which I edited in Adobe Premiere Elements 10. As you’ll hear, BFI tower wanted me tight on the downwind to accommodate a B-17 that was hopping rides. But I was down and clear before the Flying Fortress got to the traffic pattern, so I didn’t get any air-to-air video of it. First aerobatic ride of the summer in BruceAir’s Extra 300L from Boeing Field (KBFI) in Seattle. In-cockpit video captured with a ContourHD camera. Other views from the Extra’s built-in camera system. 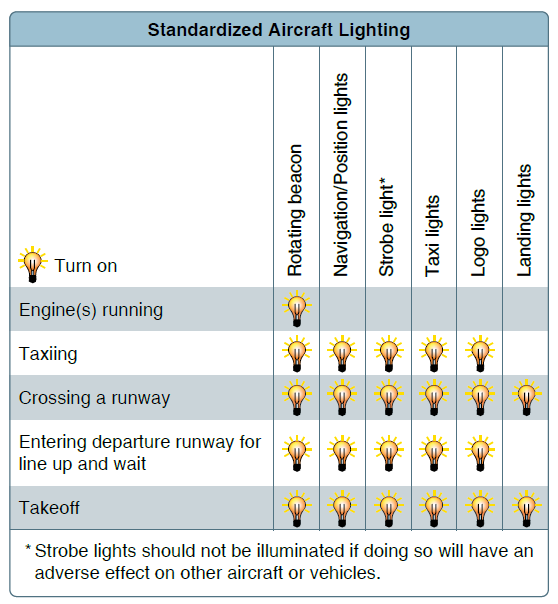 Many pilots on aviation forums have asked questions about the recommended standard operating procedures for the use of aircraft lights, especially during the day. You can find detailed recommendations in the AIM, advisory circulars, and in an update to the Pilot’s Handbook of Aeronautical Knowledge (FAA-H-8083-25A). AIM 4−3−23. Use of Aircraft Lights was updated in the latest edition. h. Use of Exterior Aircraft Lights to Make Aircraft More Conspicuous. (1) General. Exterior aircraft lights may be used to make an aircraft operating on the airport surface more conspicuous. Pilots may use various combinations of exterior lights to convey their location and intent to other pilots. Certain exterior lights may also be used in various combinations to signal whether the aircraft is on a taxiway or on a runway, in position on the runway but holding for takeoff clearance, crossing an active runway, or moving down the runway for takeoff. NOTE: Because adherence to the guidelines in this AC are voluntary and aircraft equipment varies, pilots are cautioned not to rely solely on the status of an aircraft’s lights to determine the intentions of the pilot(s) of the other aircraft. Additionally, pilots must remember to comply with operating limitations on the aircraft’s lighting systems. (2) Because adherence to the guidelines in this AC are voluntary and aircraft equipment varies, pilots are cautioned not to rely solely on the status of an aircraft’s lights to determine the intentions of the pilot(s) of the other aircraft. Additionally, pilots must remember to comply with operating limitations on the aircraft’s lighting systems. (a) Engines Running. Turn on the rotating beacon whenever an engine is running. (b) Taxiing. Prior to commencing taxi, turn on navigation, position, anti-collision, and logo lights, if available. To signal intent to other pilots, consider turning on the taxi light when the aircraft is moving or intending to move on the ground, and turning it off when stopped, yielding, or as a consideration to other pilots or ground personnel. Strobe lights should not be illuminated during taxi if they will adversely affect the vision of other pilots or ground personnel. (c) Crossing a Runway. All exterior lights should be illuminated when crossing a runway. CAUTION: Pilots should consider any adverse effects to safety that illuminating the forward facing lights will have on the vision of other pilots or ground personnel during runway crossings. (d) Entering the Departure Runway for Takeoff or LUAW. When entering a runway after being cleared for takeoff, or when taxiing into position and hold, pilots should make their aircraft more conspicuous to aircraft on final behind them and to ATC by turning on lights (except landing lights) that highlight the aircraft’s silhouette. Strobe lights should not be illuminated if they will adversely affect the vision of other pilots. (e) At Night, and When Cleared to LUAW. Consider lining up slightly (approximately 3 feet) to the left or right of the centerline (CL) to enable a landing aircraft to visually differentiate your aircraft from the runway lights. (f) Takeoff. Landing lights should be turned on when takeoff clearance is received, or when commencing takeoff roll at an airport without an operating control tower. You can also find guidance, including a handy table, in Pilot’s Handbook of Aeronautical Knowledge – Appendix 1, Runway Incursion Avoidance, an update to the PHAK published in April 2012. The FAA has released a new aviation handbook, the Flight Navigator Handbook (FAA-H-80893-18), available as a free PDF that you can download from the Aviation Handbooks & Manuals page at the FAA website. The Flight Navigator Handbook provides information on all phases of air navigation. It is a source of reference for navigators and navigator students. This handbook explains how to measure, chart the earth, and use flight instruments to solve basic navigation problems. It also contains data pertaining to flight publications, preflight planning, in-flight procedures, and low altitude navigation. A listing of references and supporting information used in this publication is at Appendix A; mathematical formulas to use as an aid in preflight and in-flight computations are at Appendix B; chart and navigation symbols are at Appendix C.; and a Celestial Computation Sheet is at Appendix D.
In this age of GPS, learning the details of navigation may seem silly, but this guide can help pilots and flight instructors understand the the important principles of aerial navigation.